Casa Pura Vida is just that pure life! Being the last house on one of the side roads of Manuel Antonio´s Pura Vida Valley makes this house perfect for the person seeking peace and quiet. 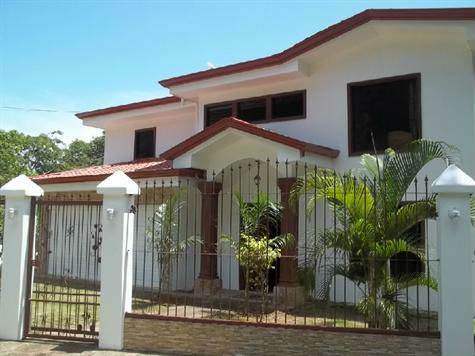 This beautifully detailed 3 bedroom home is set right in the heart of the jungle. From the pool and decks you can hear the babbling brook that runs behind the house and the sound of the breeze running through the leaves of the surrounding trees is totally relaxing. The house comes with a full kitchen, bar/living area, private pool, rancho and ample deck space to sun bath. The master bedroom has a king bed, private bath, Jacuzzi tub and walk in closet. Both guest bedrooms have a full-size bed in each and share a bathroom, also has an upstairs TV room or office. If you’re looking for peace and quiet and just minutes from the beach, well, this is the house to live and call home. Only a 5 minute drive to Manuel Antonio National! Park!